I won a red Betty Crocker cookbook once upon a time. I still use it for family favorites today – worn, dog earred and missing more than a few pages from the index and vegetable section. Bytes Big Brother used them for paper airplanes – unfortunately he didn’t grow up to become an aviator. Fortunately I had marked my favorite recipes so I could get along without a full index. Umm – yeah. Moving on — what we call Chewy Chocolate Brownies was on that list. This brownie recipe is so easy to make you can do it with two toddlers and a cat crawling around your legs after work,while you talk on the phone, catch the flour canister the three year old is trying to pull off the counter and still have a batch of brownies in the oven before the next play date is arranged. The taste will amaze the big guy who also shows up to dinner every night and satisfy your own chocolate cravings that motivated it in the first place! Got any other recipe as magical as that? These brownies fall into the chewy category – a slightly dense texture and pleasing balance of chocolate and sweet. I substitute butter instead of the shortening the original recipe called for. I think it is healthier overall and the flavor is much richer. I have melted the chocolate and butter in the microwave together for 1 minute 30 seconds, stirring after the first minute. Results may be more uniform across the variety of microwave and brand of chocolate combinations by melting them separately so that’s the way I’ve written the directions. Over time, I added more vanilla and decreased the salt. The yield on the original recipe is given as 32 brownies cut into 2 x 1 ½ inch bars. When you think about it, this is a much more reasonable size for the number of calories and carbs than the large pieces, about twice as big, that we’ve all come to expect over the last decade or so. I don’t know if that will win favor around here, but might be worth a try! 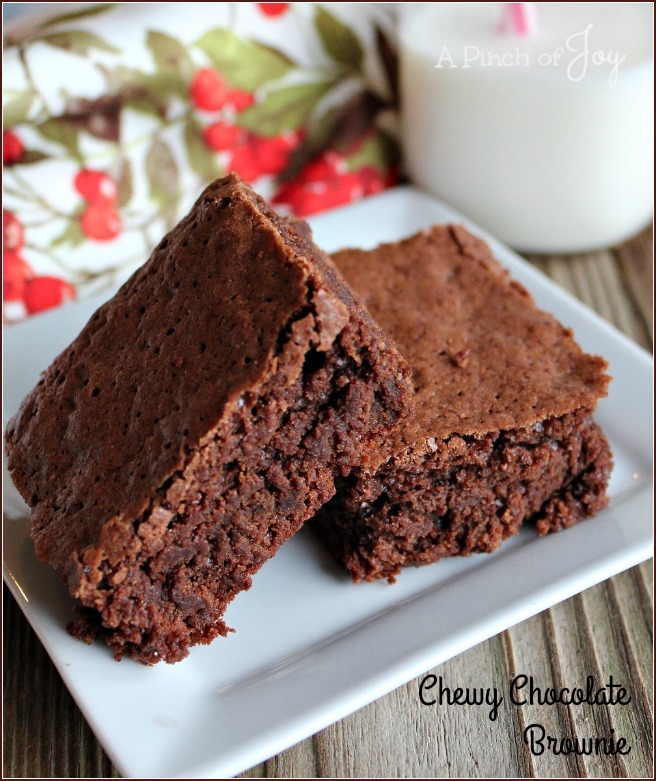 A chewy brownie with slightly dense texture and the perfect balance between chocolate and sweet. Preheat oven to 350 degrees. Prepare 9 x 13 inch pan by spraying with cooking spray or wiping with butter. Melt butter in microwave about 1 minute and mix with melted chocolate. Pour into large mixing bowl. Add sugar, eggs and vanilla and stir until just mixed. Fold in dry ingredients all at one time until just mixed. Bake for 27 - 30 minutes or until brownies start to pull away from side of pan and toothpick inserted into middle comes out clean. Do not overbake. Love chewy brownies. Thank you.